The County Health Office has issued a Cold Weather Alert for the Antelope Valley through Saturday, Dec. 7, due to the National Weather Service’s forecast for low temperatures. Minimum temperatures of 12 to 22 degrees are expected Thursday morning and Friday morning in Lancaster and Palmdale, and wind chill temperatures are expected to be below 32 degrees Fahrenheit in the Antelope Valley through Saturday. 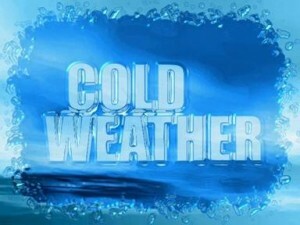 The National Weather Service advisory calls for six to eight-hour durations of sub-freezing temperatures in the Antelope Valley for each day of the advisory period. A Winter Shelter Program is available for seniors and those looking for a place to stay warm. Locations and transportation information can be found on the Los Angeles Homeless Services Authority’s website at: http://www.lahsa.org/winter_shelter_program.asp, or by calling the LA County Information line at 2-1-1 from any landline or cell phone. Install a carbon monoxide detector in your home to reduce the risk of poisoning. Symptoms of carbon monoxide poisoning include shortness of breath, headaches, muscle and joint pain, and nausea. Exposure to high levels of carbon monoxide could lead to death within minutes. Those suffering from carbon monoxide poisoning should be taken outside, into fresh air, immediately, and should be taken to an emergency room for immediate medical treatment. With freezing temperatures predicted for the Antelope Valley, the County Department of Animal Care and Control (DACC) is warning residents not to leave their pets outside overnight. The freeze warning takes effect at 9 p.m. this evening (Dec. 4) and remains in effect until 10 p.m. Friday evening (Dec. 6), county officials said. “While our pets do have some protection against dropping temperatures with their coats, they are vulnerable in overly cold weather like we are,” stated DACC Director Marcia Mayeda. DACC communications centers are staffed at all hours to help animals in need, officials said. 10 comments for "Weather Alert: Freezing temperatures expected in AV"
The city of Palmdale, the City Council, donated $8000 to the AV Fair to help shelter homeless people during this cold season. This is front page of AV Press. Will Parris find fault in this somehow? Good job Palmdale!! The City of Palmdale donated $8K to help shelter the homeless of the entire AV from the bitter cold… And where was the commitment from Wrecks & Co.? Oh and I wonder if the homeless will be welcomed at the “Magical BLVD Christmas”? What is Buck McKeon and Antonovich doing regarding this major problem? So it’s the politicians fault that there are people with mental illness or drug/ alcohol issues who can’t hold down a job and must therefore be housed, clothed and fed with money from some type of fund. Got it. There are always going to be people who can’t hack it in life and they’ll manage to live day to day whether we pay for them or not. Churches are very charitable but as is often the case, many homeless take advantage of the kindness of strangers and often steal and use drugs or alcohol on the church premises….which is why many are homeless in the first place. Too cold? Head to Santa Monica where they are welcome. I just saw on the Channel 7 news, the one and only homeless shelter run by Grace Resources cannot accommodate the many homeless people. They interviewed people that spent the night in a tent last night. Why aren’t the many churches taking care of the homeless during this unusually cold spell? I’m sure that Mayor’s Ledford and Parris are aware of this problem. So what are they doing to rectify this problem. It was 28 this morning, and icy. My family and I plus our pets slept in a warm bed and house. It is shameful that our government does not keep the homeless off the streets. God have mercy on all of us. They are homeless… Why do they stay here when it is cold…. Pan handle a few bucks and catch a train to the valley…. If you are truly concerned about them, what are you doing to help with the homeless? My church DOES support an outreach program. We are working hard trying to gather the funds and get the approvals necessary to open a shelter. My family DOES donate our time and resources to homeless people. We DO spend time talking to, serving food to, providing supplies to these people. We’ve been helping the homeless for over 18 years. Get busy. The best solution is for individuals to help. Government isn’t the solution. How about those who walk to school in the mornings? Put their coats, gloves and hats on them and send them off to school after they have had a good breakfast. Shoes or boots instead of sandals.